Basically, laminate floors are the result of a direct-pressure laminate (DPL) manufacturing process that fuses four layers (sometimes more) under extreme high pressure and heat into one highly durable board. Another process, called HPL for high-pressure laminate, is also used but has become rare because it is more expensive. Fiberboard core: The high-density fiberboard cores provide impact resistance and stability. Better products tend to offer thicker core boards and often come with edge sealing treatments to prevent against moisture seepage. Decorative layer: This layer, which is what you see from above, is actually a detailed high-definition photograph that gives the laminate the appearance of wood or tile – or anything else you can imagine. Wear layer: The wear layer is a tough, clear melamine finish often reinforced with aluminum oxide, one of the hardest mineral compounds known to man, to resist staining, fading, surface moisture and wear. Sophisticated click installation locking profiles have transformed the flooring industry and makes installation easy. These click installation systems are what makes laminate floors such a favorite among do-it-yourselfers. 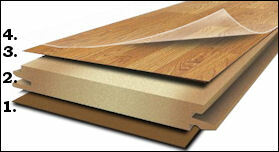 Most laminate floors come in 5 inch wide by 4 foot long planks. Because the visual layer is not limited to board size, a wood-look laminate can often appear to have several different wood planks of varying widths and lengths within each laminate plank. Embossed-in-register is a technique whereby texture is literally pressed into the floor to align with the natural design of the pattern beneath. So, for example, you’ll find wood grain textures to match the wood grain visuals on the decorative layer. Edge treatments are applied after the boards are made and most often feature sealers to prevent spills from seeping into the core. Based on how they withstand abrasion, stains, burning and swelling, laminate floors carry an AC rating number from 1 to 5 that will help you determine its relative performance level. AC1 is the lowest grade and is suitable only for moderate residential use in lower traffic areas such as bedrooms and closets. AC2 is rated for general residential applications and can be used almost anywhere in the home. AC3 for heavy residential (stairs and hallways) and light commercial applications. AC4 is a commercial grade rating for general purposes. AC5 is for heavy commercial use.